My first paying photo gig was a product shoot. It ended up turning into a regular thing for a couple of years. It wasn’t what I was passionate about, certainly not as passionate as Peter McKinnon is in this fourteen and a half minute video, but it was a lot of fun. It taught me a lot about light, shadow, reflections and perspective, and I’m so glad I had this opportunity early on in my days with a camera. It turns out that product photography was Peter McKinnon’s first photo gig, too, and his bread and butter for several years. And it’s something he’s very passionate about. In the video, Peter walks you through his thought process and how product photography allows him to get creative. He also talks about potential ways one can monetise product photography, too. Peter’s joined in the video by Matti Haapoja, whom he challenges to pick out two items from Peter’s office for him to photograph. Matti picks a small metal puzzle and a Holga medium format film camera. Then, off they head to Peter’s favourite local antique store to see what’s there, get some ideas for a theme and acquire some props. When I used to shoot products, they were more illustrative than creative. Props and set pieces were supplied along with the product, because these products were designed to be used in a particular setting. These days, though, it’s not just about the product, but about the feeling and mood it can evoke, and product photography has gone the same way. They’re placed in scenes which provide context about a possible story. Not just showing where the product is used. It’s interesting to hear Peter’s reasons why he chose certain items at the antique store to go along with the two items. And even though he did spend about $100 on props for these sessions, you won’t always have to spend this kind of money. Often you can get by spending a lot less. Of course, the more of these types of shoots you do, the bigger your prop collection gets, to the point where you eventually won’t have to spend anything for a while. If you had ever thought about trying product photography, or perhaps you’ve been asked to do it but don’t know where to start, then it’s well worth watching Peter’s video. Even if you’re not interested in product photography, because it sounds boring, I’d still watch it. You might be surprised. You’ll notice in the video that Peter’s lighting everything with a big window light. This can work very well for certain types of images, as shown here. But if you want to delve a little deeper into small product photography lighting, check out Don Giannatti’s course over on Creative Live. It’s one of the best I’ve seen in the last few years. 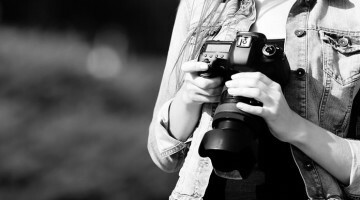 « Contrast vs Phase Detection autofocus – What it means and why it matters. It is definitely not boring. We do it every day. Usually in photography things depend on the name you make in the market. Like, if you are well known surely you would be charging more for the same type job to be done. It might help if you know a professional photographer in your circle and ask or check their prices, and if you are new to this, start with a price lower than this a bit and in time raise up. Hope this helps. That’s cool. I’ve read some “books” about product photography but Peter really makes it direct: pattern, texture, props.